Having been involved in the provision and study of canine (and equine) wellness activities since 2006, and sporting activities with dogs since 2000 (horses much, much earlier than that! 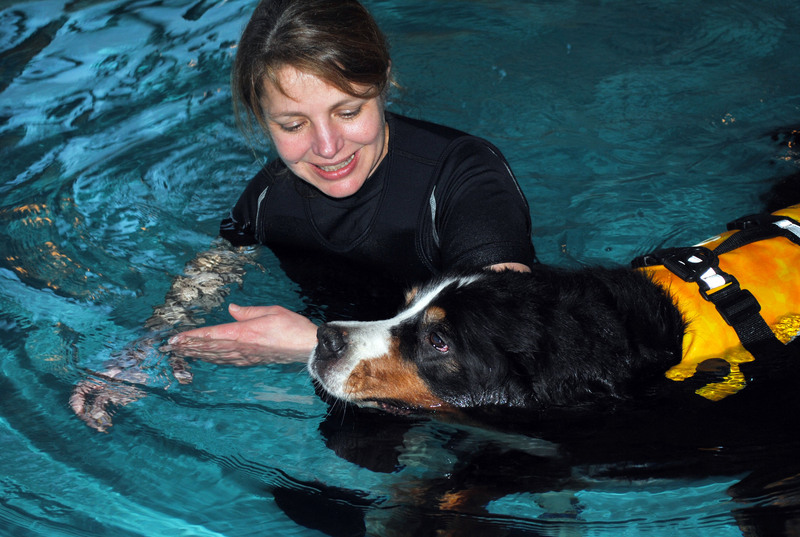 ), I developed a keen interest in hydrotherapy, and how it could be applied to canines in the same way humans were using it. In January 2012, I was contracted to provide research and development services on what was about to be Manitoba’s first (and only) canine hydrotherapy pool. It was an exciting process, and there was finally sound reason to proceed with formal hydrotherapy education! We were able to enroll with Greyfriars Hydrotherapy and Referral Centre, based in the UK – the industry leaders both in practice and in training. The pool in Winnipeg opened in May 2013, and retained my services as a trained hydrotherapist until I moved to Vancouver Island in late December 2013. It was an incredible two year journey that offered me a logical extension to the animal massage and canine conditioning work I do with Backstretch Equine and Canine Massage. 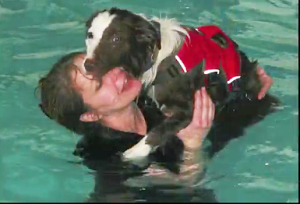 I am very proud and excited to offe r Coastal Canine Hydrotherapy and Fitness Centre for Island dogs of all types and abilities, from puppy to geriatric, athlete to sofa snuggler, healthy to recuperating from surgery or ailment, four legged and amputees. I am an enthusiastic participant in dog agility, competing at the National level, and have been instructing since January 2004. With my own and students’ dogs, I’ve seen the benefits that conditioning and cross-training, regular massage, stretching and bodywork has had on their athleticism and ability. I am in the process of developing a specific aqua-conditioning program for agility athletes. The journey into bodywork began with my first horse, who lived to be an active 35 years old. In my pursuit to give him the best senior years possible, I achieved certification as an Equine Body Worker (EBW) from Equinology Inc. in August 2006. I was awarded the 2007 J.W. Pattillo Scholarship to help further my training with advanced studies at Equinology, an honour and an opportunity that I am very grateful for. In August 2008, I became certified as a canine massage practitioner, and dogs were added to Backstretch’s services. I have also certified in Canine Myofascial Release, and continue to take various courses on a yearly basis to broaden my knowledge base and keep abreast of changes in the field. I’ve been teaching an annual class at a human massage college, and have presented a series of workshops to Dressage enthusiasts with superficial and deep muscles painted directly on the horse to demonstrate which muscle groups are engaged in different movements. I am committed to improving my knowledge and skills on an ongoing basis. This is accomplished through attending courses, seminars, workshops, and conferences; keeping abreast of current research via the web, trade publications, books and DVDs; and taking every opportunity to discuss issues with veterinarians and other professionals. I am committed to providing the best care possible to my canine (and equine) clientele. From a child, my life has always included dogs. From puppies to seniors, we’ve adopted dogs and welcomed them into our lives. While each stage of life benefits from massage and hydrotherapy, it was with my very dear senior dog that I explored these modalities. Senior’s needs vary, often requiring assistance and support of their declining physical abilities. To this end, I acheived my Canine Massage certification in 2012. 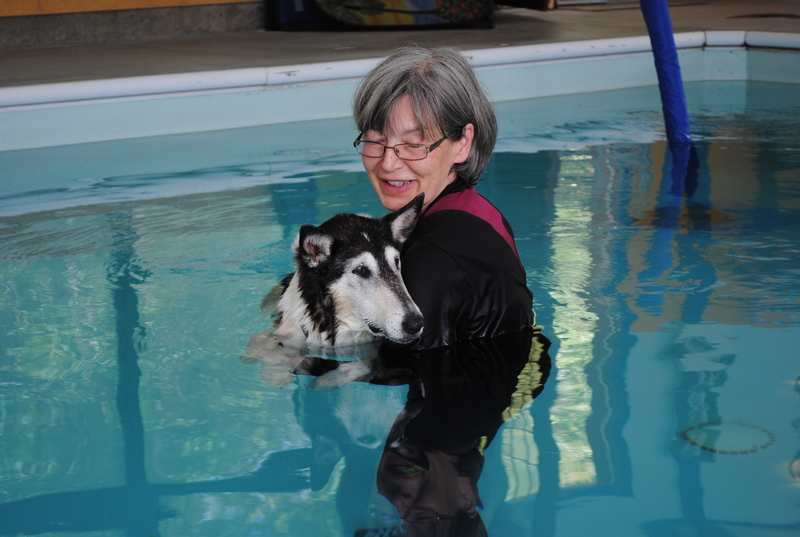 My interest in hydrotherapy began with bringing my own dog, Bubba, a 14 year old GSP, to work with Carolyn. When he began having difficulties supporting his hind end, our Veterinarian suggested swimming to build muscle mass in a non-weight bearing environment. He improved immensely and in the last year of his life, he was able to continue and enjoy the outings he so loved. When an opportunity arose to train with the prestigious Greyfriars Hydrotherapy and Referral Centre, I jumped on it! In 2015, I completed their certification course, and became a Registered Canine Hydrotherapist (RCH). In April of 2016, continuing studies provided me with a Diploma Hydrotherapy for Small Animals (Dip.HSA). The pool is an amazing environment and contributes to the health and well being of many dogs. I am proud to be a part of Coastal Canine Hydrotherapy! Current Membership Secretary with VIATA ( Vancouver Island Animal Training Association) An organization promoting reward-based humane animal training and handling on Vancouver Island. Past volunteer dog walker at my local SPCA.